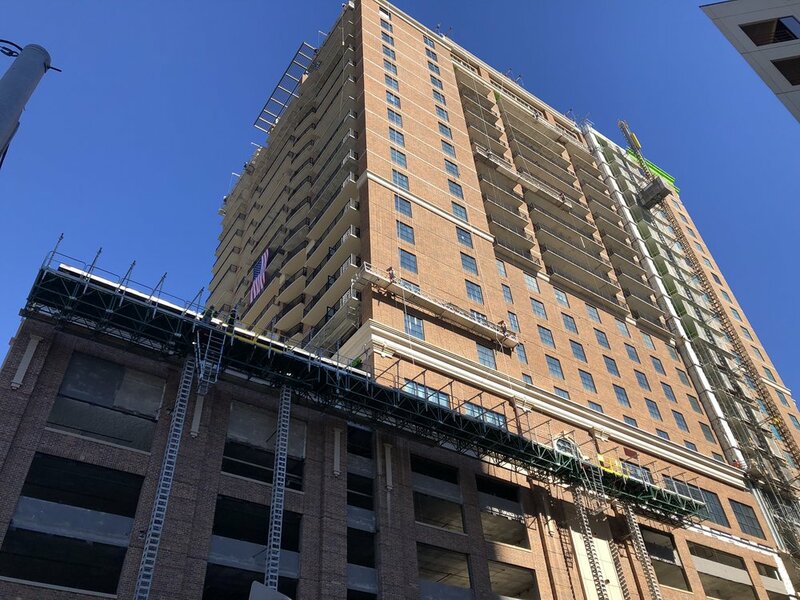 Hydro Mobile M2 Units wrapped the entire masonry high rise of the Market Square project in Houston, Texas. Hydro Mobile M2 Mast Climbers were used on this masonry stadium on the Prairie View Texas A&M Campus. The P series units were used on this project on top of already in place canopies because of their small footprint, allowing the tile setters to stay safe and productive while setting oversized tile pieces. The M2 and P Series Hydro Mobile Mast Climber units helped this masonry project on the tight campus of the University of Texas be a safe and productive one. The Ft. Bliss Medical project has been a huge masonry, multi-year project using a combination of both M2 and P Series Hydro Mobile Mast Climber units to keep the project on schedule, safe, and productive. Hydro Mobile P Series Mast Climbers were used on this project with a hoist since they needed to fit into a tight area on top of another structure. The P series hoist was helpful in keeping the masons stocked on this masonry high rise in Dallas, Texas. Hydro Mobile M2 mast climbers were used on these elevator shafts in combination with the Hydro Mobile M2 Hoist that will lift 4,000 lbs at 65’ per minute. Fast pace masonry project using Hydro Mobile M2 mast climber units with Hoist on top of a parking garage in Irving, Texas. Spec Rents provided most of the installation and dismantle for this project. Hydro Mobile M2 and P Series Mast Climbers were used on the new Hotel & Conference Center at Texas A&M University in College Station, TX. These mast climbers were used as a shared scaffold system with a combination of Multi-Purpose Insert (MPI) bridging and P Series to make the returns necessary for multiple trades to stay productive. A M2 Hoist was also utilized to keep the teams continuously stocked with necessary materials without the additional cost of a high-reach forklift. Hydro Mobile M2 and P Series Mast Climbers, Overhead Protection. Hydro Mobile M2 Mast Climbers were used on this Costco project in Frisco, Texas to help the mason keep up with the aggressive schedule on this block project. Hydro Mobile M2 Mast Climbers were used on Katy Middle School 16 to help the mason contractor increase their productivity.